The future is looking good for the Pittsburgh Pirates. After many of struggling, they're pulling together a strong lineup of promising young stars. Gregory Polanco is another piece in the puzzle that also includes Andrew McCutchen, Starling Marte and Gerrit Cole. 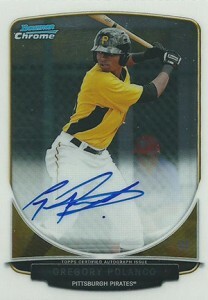 Although collectors are still waiting on Gregory Polanco rookie cards, he does have lots of prospect cards already. These include several autographs and a couple of memorabilia cards. 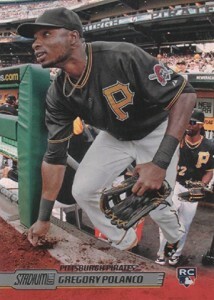 Shop for Gregory Polanco cards on eBay. The Pirates signed Polanco as a free agent out of the Dominican Republic in 2009. After working his way up through the minors, the speedy outfielder made his debut in June, 2014 at the age of 22. Polanco's MLB career got off to a fast start, getting hits in his first 11 games. Below is a visual guide to Gregory Polanco rookie cards. You can click on the tab at the top to see his top prospect cards that were out before his debut. Please note that this list is a work in progress. 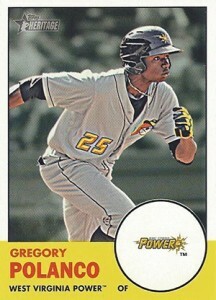 We'll add to it as more Gregory Polanco rookie cards are released. 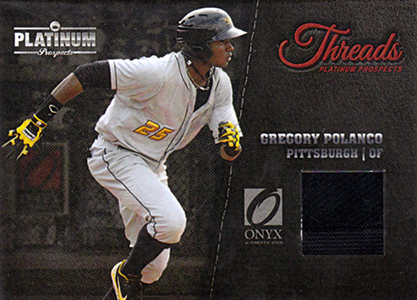 The following are highlights of some of the top Gregory Polanco cards released prior to his MLB debut. All are either inserts or from sets consisting of prospects. As a result, none are rookie cards. 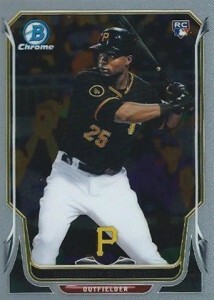 2012 Bowman Chrome Baseball is home to the first card featuring the outfielder in a MLB uniform. Because his autograph didn't come until a year later, this one should hold a little added interest. The base version remains affordable, although there are plenty of Refractor versions to chase. Clearly a minor league card, the appeal of this card is its price. 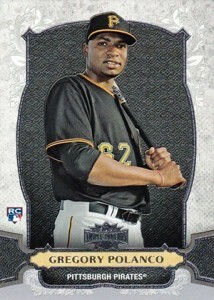 Although it's one of the first widely available Gregory Polanco cards, it's cheap. It also has a retro vibe that a lot of his early cards lack. 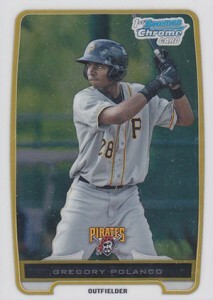 Although this isn't Gregory Polanco's rookie card, it's likely going to be his top card in a lot of ways. His first autograph in Pirates gear, it comes with the Bowman Chrome name, a brand that has become a go-to for prospectors. 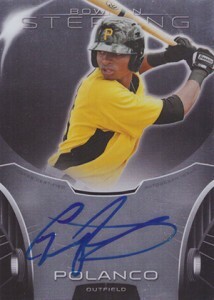 So while the 2013 Bowman Chrome Gregory Polanco autograph is an insert, it's traded a lot like a traditional rookie card. It can be found in 2013 Bowman Baseball boxes. If you're looking for a Gregory Polanco autograph that's on the rare side but not strictly a parallel, there's the 2013 Bowman Black Collection insert. Signed in silver, the card has a print run of 25 copies. It's part of a multi-year, cross-brand autograph program. 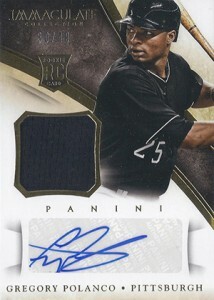 Like his Bowman Chrome Autograph, this card can be found in 2013 Bowman Baseball. 2013 Bowman Inception marked the brand's debut in baseball. Its distinct designs and on-card autographs made the release a hit. 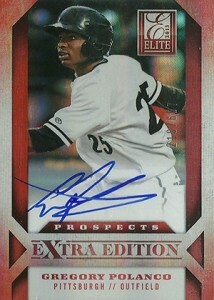 It's also a bargain compared to his Bowman Chrome card, selling at less than half the price. 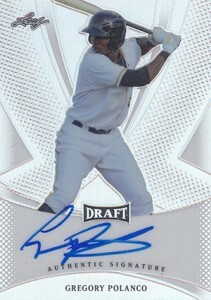 The 2013 Bowman Sterling Gregory Polanco sits between Chrome and Inception as far as values go. Like the other two, it has an on-card autograph and several parallel versions. Going the single-card route is probably the best option for this one as box prices are so high. 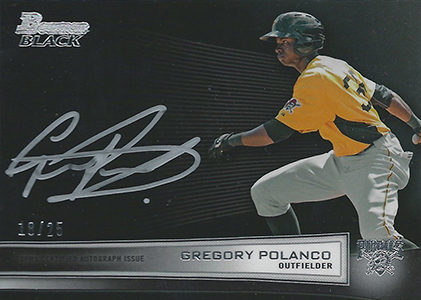 The 2013 Leaf Metal Draft Gregory Polanco autograph is short print. Although not numbered, it has a confirmed print run of 40 copies. It's a solid alternative that combines a strong chromium design with rarity. The only thing it's lacking is logos, which some likely won't mind but it probably won't reach a lot of iconic notoriety over the long-term. 2013 Leaf Trinity Baseball has three distinct designs, all of which make for high-end autographs. The first is the Inscriptions card. Numbered to 30, it comes with a hand-written note along with the standard signature. The card also has a handful of parallels. This Patch Autograph card has a lot of eye appeal. The patch swatch might not be game-used, but it does make for an attractive card. It isn't serial numbered, but Lead has confirmed the base version has a print run of 60. 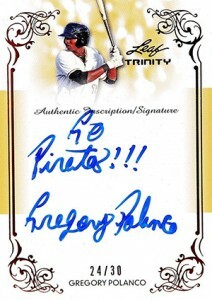 2013 Leaf Trinity Pure Autographs are printed on on a plexiglass-style stock that pictures cannot give justice to. The layered appearance is unique (in a good way). Gregory Polanco's first game-used card doesn't come from a major manufacturer. Onyx included a limited number of memorabilia cards in 2013 Platinum Prospects, many of which can be found with tag pieces. 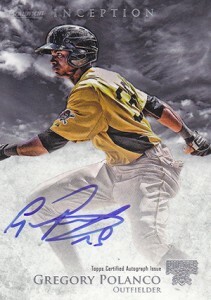 This is another affordable alternative when it comes to early Gregory Polanco autograph cards. It might not have MLB's blessings, but the Elite Extra Edition brand has been around for a long time. Signed on-card, it's also serial numbered, something that none of the non-parallel Bowman autographs has.